A heartwarming tale of terror in the middle of the zombie apocalypse. Meet Sarah and David. Once upon a time, they met and fell in love. But now they’re on the verge of divorce and going to couples’ counseling. 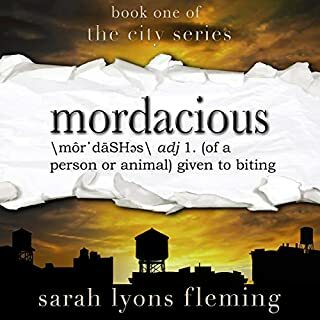 On a routine trip to their counselor, they notice a few odd things: the lack of cars on the highway, the missing security guard, and the fact that their counselor, Dr. Kelly, is ripping out her previous client’s throat. Meet the zombies. Now Sarah and David are fighting for survival in the middle of the zombie apocalypse. But just because there are zombies, doesn’t mean your other problems go away. If the zombies don’t eat their brains, they might just kill each other. They did realize this was supposed to be a professional reading right? Whoever edited this together needs to go back to school because every 3-10 sentences I get an horrible squeaking screech that sounds like some seriously bad feedback. I can't even focus on the honestly good story because I'm tensed up waiting for another attack to my ears. This is a good book, but not a great book. It's easy to sit through and follow. The narrator isn't horrible. 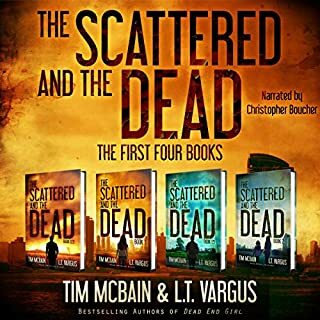 And if you are a fan of zombies, then this is an interesting story that sets the stage for the other two hopefully to finish off. I did research on the book and discovered its first in a trilogy, so don't expect to have all your questions answered right off the bat. It can get pretty cheesy at times, but you can tell it's on purpose and meant to lighten the mood. I found myself saying "Did she really just write that?!" a few times during some of the dialog or zombie executions. The couple is believable to an extent, but for the parts that aren't you just don't care because its just a fun little read. So, all my complaints that I could have about it considered, I just don't care. I enjoyed myself, and I think you will too. Just don't expect it to be the most profound writing ever. It's very lighthearted for most of it, to counterbalance some of the deep depressing sections that you have to have in order for there to be any drama in a zombie apocalypse. I recommend this because of it's entertainment value. It's not as depressing as some things (except a few pretty sad moments), but you still get your fill of zombie fun. 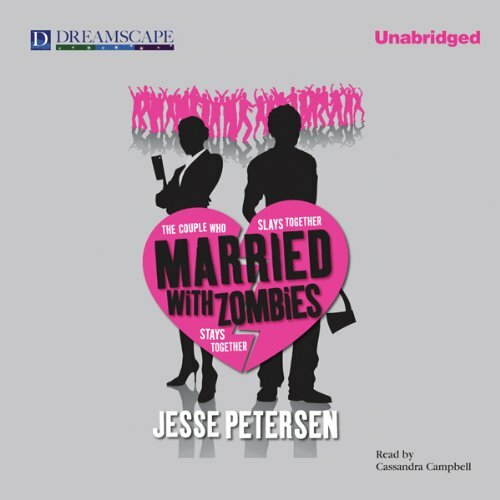 This is a great listen, I don't normally listen to Zombie books, but this one is fantastic. Petersen has a great sense of humor and Campbell is a terrific narrator. Another pretty stereotypical zombie read. The difference and theme the author presents with this one is a couple having serious marital issues and how their personal conflicts come out during a zombie infection. I found a lot of the dialogue to be rather uninteresting. It was nice to see the characters resolve their issues and come together, but the common martial bickering got somewhat annoying. The zombie theme is definitely reaching it's all time high in popularity and several books have really shined. After reading Patient Zero and World War Z, it's very difficult for me to enjoy books in the genre with little to offer. The zombie portions of the story felt copied from so many already out there that I had a hard time enjoying it. Maybe if I had listened to this a couple of years ago I may have enjoyed it more but it takes a bit more to keep me interested in this genre these days. Another thing worth noting is that the male characters all felt intentionally removed of most intelligence. This may make sense due to the fact that the entire story is told from the female characters perspective. I can often hear my own girlfriend's thoughts in her narrative, but it might bother some male readers. It wasn't over the top male bashing, but it's worth mentioning. I'm giving it three stars for some entertaining zombie action and making a good attempt at joining a martial help book with the zombie apocalypse. 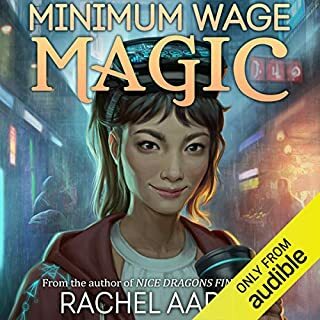 I might read/listen to the second book, it depends on how well it's reviewed and what she does to make it shine in a genre overflowing with options. The narrator is female, which makes sense, and did a good job with most of the characters in the book. Unfortunately the one I really felt she missed was David. 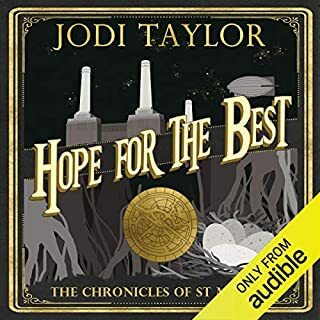 The narrator really did a great job with the other characters, but unfortunately I can only give her 3 stars since I felt she missed on one of the main characters in the book. The rest of her voices are great, too bad it had to be a main character. Would you try another book from Jesse Petersen and/or Cassandra Campbell? i might pick up the second and third if they were on sale. while listening to mwz (married with zombies), i kept thinking of zombieland and zombie fallout. in zombieland, columbus has a bunch of rules for surviving. in mwz, each chapter's title is a rule for a married couple to not only survive a zombie apocalypse but also their marriage, e.g. the couple that slays together stays together. i thought these were kind of smart, funny, and well thought out. these rules also foreshadow the coming plot. i thought of zf (zombie fallout) b/c of all the bickering b/ween sarah and dave. i think jesse petersen does an ok job of infusing humor. not as funny as zf, but i laughed quite a few times. but that's where the comparisons end. the zombies were kind of lame- red eyes and black goo coming out of their mouths. i was left wondering where all the zombies went. 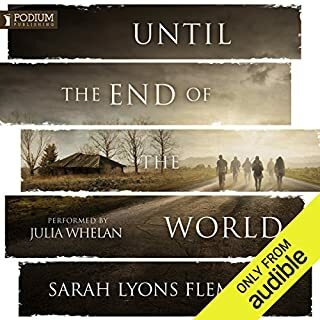 sarah and dave do one of the biggest no-no's- get on the highway at the beginning of a zombie apocalypse, but all the action is already passed. there are only a few lingering zombies among the car wrecks, and they pass through w/o to much effort. in my favorite zombie books, the authors are able to build tension culminating in a sense of impending doom. neither is present here. i never felt the characters were in real danger. when they were, they escaped way too easily jst to move the plot forward. alright! i'm done lambasting the book! :-) if you're looking for a soft core zombie book with some humor, give this one a shot. if you read a lot of dark and dreary zombie books, let this one cleanse your palette. I must say I was surprised by two touching moments. Of course, they were death scenes, but they were well done! overall, it makes an ok beach read. well, summer's over but you know what i mean. you can kick back, turn off your thinker, laugh a few times, and wonder where half of your day went. I really enjoyed this zombie book. It has lighthearted zombie action and good humor with some gore thrown in. A couple try to work through their marital problems while trying to stay alive at the same time. Funny and interesting take on zombies. It would make a good series. Best Zombie Book Ever. A Chick-lit Zombie Book! What made the experience of listening to Married with Zombies the most enjoyable? I read this in print form several years ago. I absolutely loved it. While I love to read, who has the time? Audio-books are always better because you can do stuff while listening. This is a brilliant book and Cassandra Campbell gave an excellent performance. What could be better than being productive while being entertained by a phenomenal story? What was one of the most memorable moments of Married with Zombies? This book is filled with memorable moments. Pick almost any action scene. David and Sarah killing their marriage counselor was funny and suspenseful. The couple having to shoot the cheerleader was horrible and well-written. Meeting the cult group in the casino certainly left an indelible impression. I could go on and on. The whole book is just really good. I was amazed at how versatile her voice was. She got every character dead on. She totally captured the main character, Sarah and seamlessly switched to a perfect David. As a female narrator, she does the best male voices I've ever heard. Zombie Apocalypse--A Marriage Building Exercise. I got this on a whim because I had an extra credit during my account. I'm really glad I did. It's cute, well written and well, if you're married...you understand where they're coming from. zombie survival with love, laughs and gore!!! The book caught in the first 15 mins. 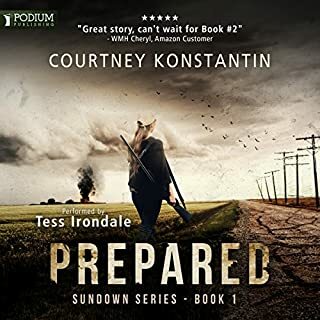 I was pleasantly surprised to fine how well the author put a zombie apocalypse together with what in fact is a story about a couple struggling in their marriage and questioning whether or not they will stay together. I found the story very entertaining and the narrator did a wonderful job with her voices for each character. For us ZA lovers or zombie apocalyse for you 'normies' we get our fill of zombie gore and action, with some impressive zombie kills. The humour is indeed dry but works well with the tone of the story. All in all if you like ZA books like me don't be turned off by the title this is far from just a soggy soppy teary love story. Its just excellent fun. If you could sum up Married with Zombies in three words, what would they be? I found that Sara the main character is very compelling the story is told from her point of view and while in may books the main character is the glue that hold the funny interesting accessory characters but in this I found myself most interested in Sara and what she had to say. She is a witty and strong character. Following Dave and Sara in their apt realizing what is happing around them and learning to deal with it. Who was the most memorable character of Married with Zombies and why? .This is told from a first person journal point of view. Sara the main character is smart witty and very honest in her telling of the attack and her thoughts and feelings at the time. This book is a very fun quick summer read. The whole story is less then 7 hours and that seems to be just about the right time. The story does not feel that it slows down or lingers on too long in so that the pacing is excellent. I have always been a fan of zombie movies and this was my first foray into a zombie book. Now I am a fan of Zombies in book form.